The creature has a segmented body with a dark brown head and many legs (though we aren’t sure exactly how many.) 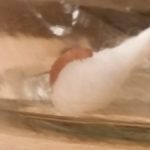 While at first glance we don’t recognize this specimen, that is actually really good news for our reader! 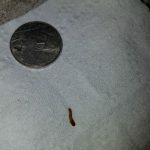 The most common organisms that readers find on their beds are carpet beetle larvae, and this is definitely not a carpet beetle larva. 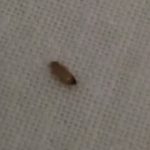 Carpet beetle larvae are particularly annoying household pests because they have destructive appetites and can do a lot of damage to household items such as furniture and fabrics. 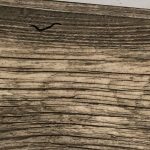 They feed on a wide range of materials, including animal products such as wool and feathers, so it makes sense that they are often found by our readers on their beds. 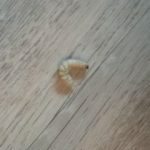 Getting rid of carpet beetle can be quite a headache, but luckily our reader can avoid that. 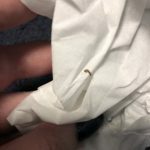 While we aren’t totally sure what our reader discovered, we can confirm with confidence that it isn’t a carpet beetle larva. Its numerous legs and segmented body remind of us a millipede, but we don’t think that’s a match either. 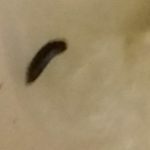 We believe it is either moth larva or beetle larva, but we aren’t sure which based on the limited information that we have. Regardless, we don’t think our reader needs to worry too much about this specimen. We recommend she change her sheets and investigate her mattress and bedding, but as long as she has only found one of the specimens, she shouldn’t go out and buy a new mattress. If she discovers more creatures, then she might be dealing with a bigger issue, but until she has proof we encourage her to stay calm! 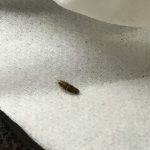 To wrap up, we aren’t sure if the creature our reader found on her bed is a moth larva or beetle larva, but we are confident that it isn’t a carpet beetle larvae. We think changing her sheets and washing her bedding is a good idea, but we don’t think she needs to begin an intense cleaning regime or purchase a new mattress! 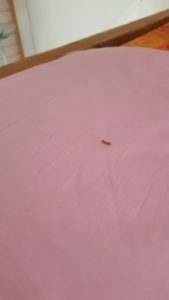 We aren't sure if the creature our reader found on her bed is a moth larva or beetle larva, but we are confident that it isn't a carpet beetle larvae. We think changing her sheets and washing her bedding is a good idea, but we don't think she needs to begin an intense cleaning regime or purchase a new mattress!